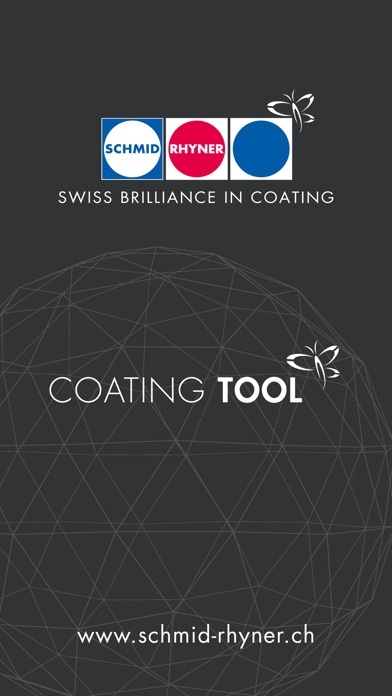 Coating production made easy! If you are a press operator or print shop owner, your work just became easier: with the Schmid Rhyner Coating Tool. 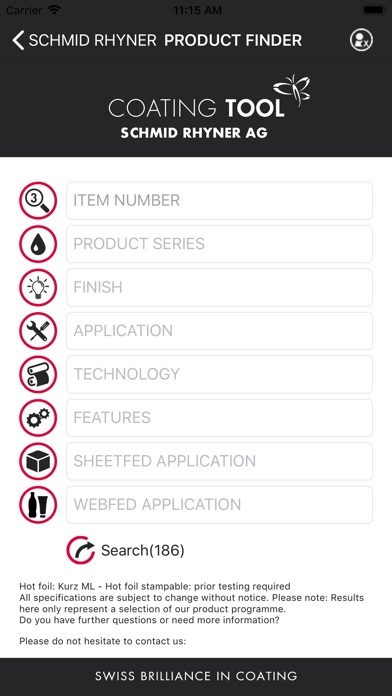 This useful reference app helps you quickly find the perfect product for every application. You will also have access to the complete specifications and safety data sheets of our products. If you have questions, feel free to contact us; you can also send us a photo to illustrate your issue. 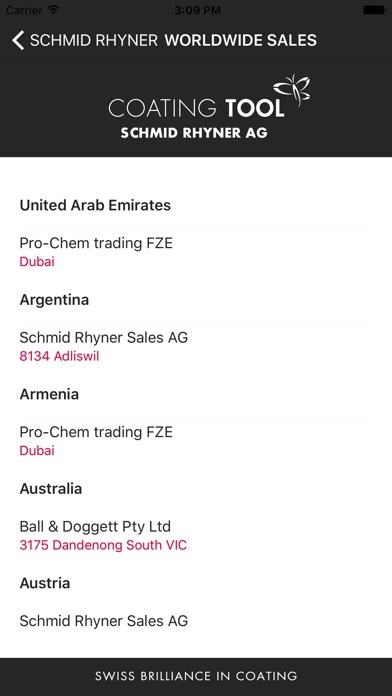 Finally, the app contains a list of our partners around the world - it's never been easier to find your personal contact. 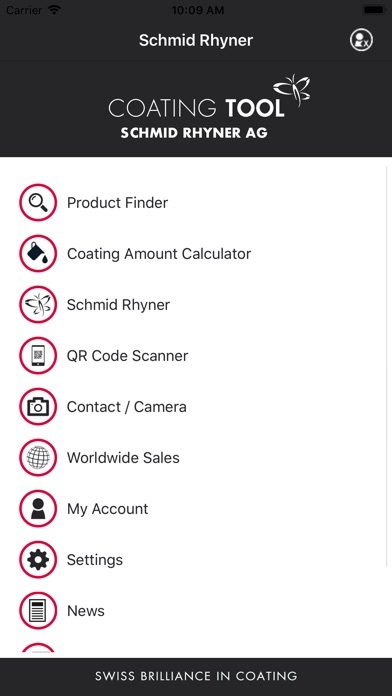 This app is issued by Schmid Rhyner AG. 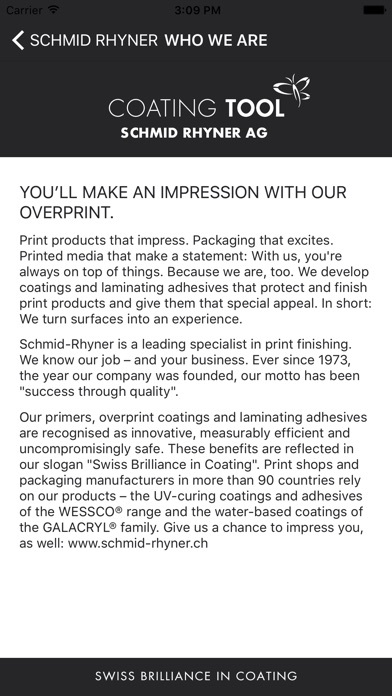 Schmid Rhyner provides customers with finishing solutions for their high-quality print products and packages. In addition to protecting valuable print products, innovative UV coatings offer unique surface effects: Used as creative design tools, they have the potential to make your product stand out and generate considerable added value at the point of sale. Modern solutions also offer better forgery protection and frequently help simplify production processes for customers. As a technology leader, Schmidt Rhyner often develops custom coatings in close cooperation with brand manufacturers, printing press manufacturers and raw materials suppliers. Comprehensive consulting and training covering topics from graphic design to food packaging safety are important elements of our portfolio. Schmid Rhyner coatings are eco-friendly, solvent-free and recyclable. They are used in many industry sectors including pharmaceutics, cosmetics, food, drink and tobacco. The app is subject to continuous improvement – regular updates ensure that customers continue to benefit from useful features that make their work easier.